The cabinet is fully customisable as it is made to order. Please contact us if you would wish it in different colours/finishes. Italian boat bow shaped bar cabinet or dry bar from 1960s. 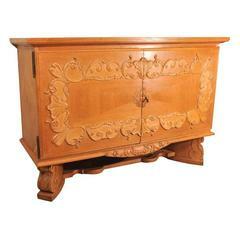 Blonde oak two-door credenza with inlay with carved relief and stretcher base. Sycamore interior. Centre split top folds back. Interior shelving and 12 bottle holders. Cityscape by Paul Evans Studio for Directional. Brass and chrome credenza. Features flip-up top serving section, two adjustable shelves. Portions restored [Signed Paul Evans].